LAGO AGRIO, Ecuador, August 6, 2012 (ENS) – U.S. oil giant Chevron has until midnight tonight to pay a US$19.04 billion Ecuador court judgment for polluting Amazon waterways or officially default and face another lawsuit to seize its assets, this time in Ecuador. 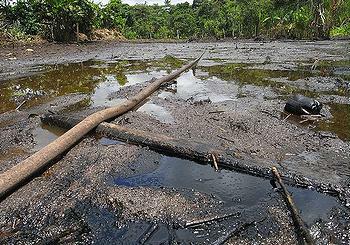 Such collection lawsuits are pending against Chevron in Canada and Brazil. Ecuador Judge Liliana Ortiz on Friday signed an order giving Chevron until midnight tonight to deposit the funds necessary to remediate the oil contamination, which included the dumping of more than 16 billion gallons of toxic waste from oil production into Amazon waterways. Judge Ortiz’s order comes after almost 19 years of litigation. The case, Aguinda v. ChevronTexaco, began on November 3, 1993 when 30,000 indigenous people and farmers from Ecuador’s Amazon filed a class action suit against Texaco in New York federal court alleging massive oil contamination of the rainforest. For 10 years, Texaco argued before U.S. judges that the case should be transferred to Ecuador’s courts. In 2002, a U.S. federal judge granted Texaco’s motion and removed the case to Ecuador on the condition that Texaco submit to jurisdiction there and be bound by any ruling of the Ecuadorian courts. In the meantime, Chevron bought Texaco in 2001, assuming its liabilities and defense of the case. Texaco operated in Ecuador from 1964 to 1992, building hundreds of oil production facilities. The trial judge in Lagio Agrio found overwhelming evidence that the company dumped billions of gallons of toxic waste into Amazon waterways as a cost-saving measure. Five indigenous groups in the area have been harmed by the pollution that covers an area the size of Rhode Island. The contamination also caused an outbreak of cancer that has killed or threatens to kill thousands of people in the area, according to evidence before the court. Judge Ortiz’s order is the final step under Ecuador civil procedure to certify the 188-page trial court judgment, which was issued on February 11, 2011. That judgement was unanimously affirmed on appeal in early January. It set the amount of the judgment at $18.2 billion. Last week, Judge Ortiz raised the final amount of the award to $19.041 billion after calculating various mandatory costs required by Ecuador law. Chevron stripped most of its primary assets, including service stations, from Ecuador years ago and the company no longer operates in the country. Pablo Fajardo, the lead Ecuador lawyer on the case, says that for practical purposes, Judge Ortiz’s order allows the rainforest communities to execute the Ecuador judgment against Chevron’s remaining assets in their home country. Fajardo estimates Chevron’s remaining assets in Ecuador are worth roughly $200 million, including a $96 million court judgment the company won recently in an international arbitration proceeding against Ecuador’s government. Judge Ortiz’s order also puts the plaintiffs in a stronger legal position to pursue recognition of the Ecuador judgment abroad under various international treaties and domestic law statutes. Collection lawsuits are pending against Chevron in Canada and Brazil, where the company has billions of dollars worth of assets. The plaintiffs are asking courts to seize to seize these assets to satisfy the judgment and finance a cleanup of the oil contamination, said Fajardo. “After the remediation was certified by all agencies of the Ecuadorian government responsible for oversight, TexPet received a complete release from Ecuador’s national, provincial, and municipal governments that extinguished all claims before Chevron acquired TexPet in 2001,” the company says. “All legitimate scientific evidence exonerates Chevron and proves that the remediated sites pose no significant risks to human health or the environment,” Chevron says on its website. If Chevron refuses to pay the court judgment, the company will face a greater risk of liability in the enforcement actions already pending, said Karen Hinton, the U.S. spokesperson for the indigenous and farmer plaintiffs. If Chevron defaults, Fajardo said his legal team will file court actions to seize the intellectual property rights of various Chevron brands in Ecuador, including Havoline. Ultimately, Fajardo said he expects that judges in Ecuador and elsewhere will force the auctioning off of Chevron assets so the proceeds can be used to secure the cleanup mandated by the Ecuador trial court. Ecuador is currently auctioning off drilling rights in several large fields in the Amazon region. Chevron apparently will be left out of the bidding until it pays the full amount of the judgment, a risk factor that has angered institutional shareholders who have called on the company to settle the case. 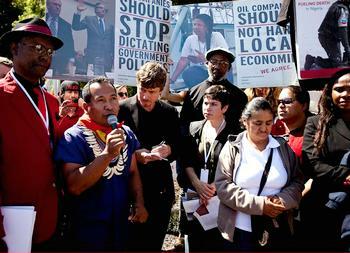 “In failing to negotiate a reasonable settlement prior to the Ecuadorian court’s ruling against the company, we believe that Chevron’s Board of Directors and management displayed poor judgment that has exposed the Corporation to a substantial financial liability and risk to its operations,” the investors said in their letter. On June 6, U.S. Congresswoman Jan Schakowsky, an Illinois Democrat, requested that the Securities and Exchange Commission open an investigation to determine if the company is hiding its risks from shareholders.